India has a huge burden of β-thalassemia with an estimated 100,000 patients and a prevalence of 3%–4% carriers. The five common mutations reported in the India are IVS 1–5 (G->C), IVS 1-1 (G->T), codon 41/42 (-TCTT), codon 8/9, and 619 bp deletion. We report this rare case of IVS 1-1 G>C variant (hemoglobin [Hb] Monroe) in homozygous form in a child of Goan origin. The propositus presented at 3 months with pallor, hepatosplenomegaly, and lymphadenopathy. Diagnostic workup of the child was suggestive of β-thalassemia major, the parents Hb electrophoresis revealed β-thalassemia trait in the mother, whereas the father had elevated HbF levels. Initial polymerase chain reaction by ARMS (amplification-refractory mutation specific) was negative for the common five mutations. β-globin full gene sequencing revealed the presence of IVS-1-1G>C (Hb Monroe) in the homozygous form and also c.-92 C>G in the homozygous form, the mother was heterozygous for both the mutations, whereas the father was negative. STR marker studies did not indicate uniparental disomy to be the reason for IVS-1-1 G>T homozygosity in the child in the absence of the same mutation in the father. The father showed a possibility of δβ deletional mutation. This report highlights the importance of molecular studies in participants with borderline HbA2 levels, including spouse of a typical β-thalassemia carrier. Assaying for only the common five mutations may not yield complete answers. Full gene sequencing should be performed in those individuals with a strong phenotype of β-thalassemia. The prenatal diagnosis should be offered to couples at risk. India has a huge burden of β-thalassemia with an estimated 100,000 patients and a prevalence of 3%–4% carriers (which translates to 35–45 million carriers) with a higher prevalence (4%–17%) in several ethnic groups. Although there are >535 HBB gene mutations, a subset of ~40 mutations is responsible for the majority of β-thalassemia cases worldwide. In Indian patients, five mutations account for 92% of the β-thalassemia alleles which are 619 bp deletion, IVS 1–5 (G>C), IVS 1–1 (G>T), FS 8/9(+G), and FS 41/42 (-CTTT). In northern states, the most common mutations are IVS 1–5 G>C (43.5%), FS 8/9 + G (38.5%), and FS 41/42–CTTT (6.6%)., Micromapping of the submutations in Maharashtra and Gujarat has indicated IVS 1–5 (G>C), codon 15 (G>A), and codon 30 (G>C) to account for 87.9% of the mutations in Maharashtra, whereas in Gujarat, IVS 1–5 G>C, 619 bp deletion, and codon 5 (-CT) accounted for 68.5% mutation. Different investigators have reported rare mutations as codon 5 (-CT), codon 47–48 (+ATCT), codon 15 (G>A), codon 30 (G>C), and codon 16 (-C) from different parts of the Indian subcontinent.,, It is important to identify and highlight the different mutations in Indian participants which have significant implications for developing adequate control programs. The proband was a 3-month-old female infant, born out of nonconsanguineous marriage. She presented with a history of noticing pallor and inadequate weight gain. Clinical examination confirmed pallor and presence of hepatosplenomegaly, without lymphadenopathy. Congestive cardiac heart failure was ruled out. Complete hemogram of the proband and parents was done with the five part Coulter Counter (Beckman Coulter, USA). The analysis of hemoglobin (Hb) fractions was done on the Bio-Rad VARIANT HPLC system (Bio-Rad Laboratories). Genomic DNA was isolated from peripheral blood leukocytes using the Qiagen DNA Purification Kit (Qiagen, Germantown, MD, USA). 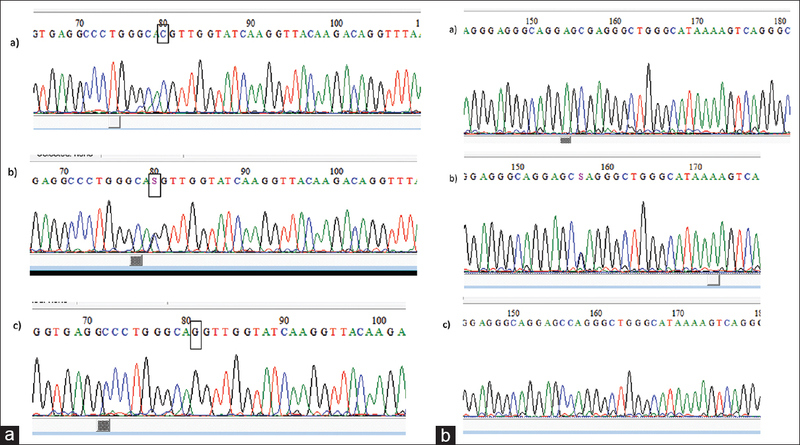 Multiplex-ARMS polymerase chain reaction (PCR) for common five mutations, namely, 619 bp deletion, IVS 1–5 (G>C), IVS 1–1 (G>T), FS 8/9 (+G), and FS 41/42 (-CTTT) was performed as previously described. The β-globin full gene was amplified and sequenced using the appropriate primers as designed by the authors on the ABI Prism 3500 Dx genetic analyzer (Applied Biosystems, Foster City, CA, USA). The sequence was compared with the NCBI RefSeq entry for the HBB gene (NG_000007.3). HbVar database was used for the identification of the presence of reported mutations. HBG-XMn1 and-68 C>T variants were identified by previously described protocol. Hereditary persistence of fetal Hb (HPFH) was determined by GAP PCR by Craig et al. Uniparental disomy was ruled out by Identifiler kit from ABI which analysis 15 STR markers. 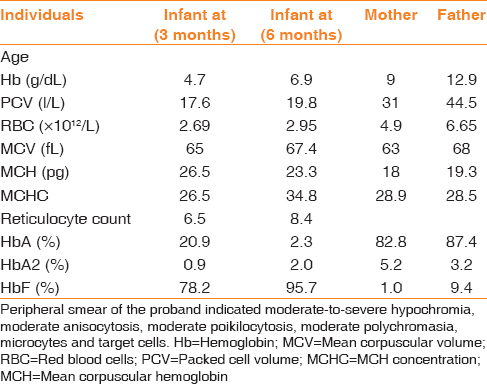 The complete hemogram of the proband and parents is shown in [Table 1]. HPLC analysis indicated the percentages of Hb fractions at 3 months as HbA – 20.9; HbF – 78.2; and HbA2 – 0.9; at 6 months as HbA – 2.3; HbF – 95.7; and HbA2 – 2.0 for the proband; for the mother, the fractions were HbA – 82.8; HbF – 1.0; and HbA2 – 5.2; and for the father, they were HbA – 87.4; HbF – 9.4; and HbA2 – 3.2. Initial PCR by ARMS (amplification-refractory mutation specific) was negative for four of the common five mutations, i.e., 619 bp deletion, IVS 1–5 (G>C), FS 8/9 (+G), FS 41/42 (-CTTT) in the proband indicated but yielded amplification failure at IVS 1–1 (G>T). Hence, β-globin full gene sequencing was then performed for the infant which revealed the presence of IVS-1–1G>C (Hb Monroe) and also c.-92 C>G mutations, both in the homozygous form. Full gene sequencing of the mother revealed the presence of IVS-1-1G>C and also c.-92 C>G although both were heterozygous, whereas no mutations were seen in the father [Figure 1]a and [Figure 1]b. Since the proband exhibited both these mutations in homozygous form, the mother was heterozygous, whereas the father did not exhibit either of these, it was thought prudent to rule out the possibility that the father may have a δβ deletional mutation. HPFH-3 causing 48.5 kb deletion in the β-globin gene cluster the most common form reported in India was neither seen in the father nor was the Indian Inv/Del Gγ(Aγδβ)0 seen (data not shown). Uniparental disomy in the proband was also ruled out. The HBG-Xmn1 polymorphism (rs7482144A>G) representative of the Arab-Indian haplotype which is associated with higher HbF levels was seen in heterozygous state “AG” in the father, whereas both the mother and proband showed the “GG” genotype [Figure 2]. HBD c.-68C>T variant which is in the 5' promoter region to the HBD gene and is in strong LD (linkage disequilibrium) with the rs7482144 was seen as “CC” genotype in proband as well as parents [Figure 2]. In this case report and family study, the proband showed the presence of HBB c. 92G>C (IVS 1–1) G>C along with -92 C>G variant both in the homozygous form. The IVS 1–1 G>C also called Hb Monroe was first reported in a transfusion-dependent 15-year-old female from the USA. Later, it was reported in other populations (Bangladesh,, Tunisians, Tajiks, and South of Iran). Interestingly, in the Tajik patient as well as Bangladesh, both Hb Monroe and -92 C>G were seen indicating the two to be in strong LD. The Hb Monroe results from a splice site point mutation in the last nucleotide of the β-globin exon 1 which is also the penultimate nucleotide of codon 30. Initial reports have suggested either unstable mutant peptide or aberrantly processed mRNA to be the basis of thalassemia phenotype. However, subsequent studies by Agarwal et al. using real-time quantitative PCR following in vitro expansion of peripheral blood erythroid progenetors could not detect the mutant peptide in fresh hemolysate or in reticulocytes. Furthermore, these participants had >70% reduction of the β-globin gene expression as compared to normal controls. This led the authors to conclude that this missense mutation not only leads to undetectable mutant peptide but also interferes with the expression of the wild-type allele. The pathomechanism of the-92 C>G variant, however, is still not clearly elucidated. In silico analysis has predicted this mutation to be within the predicted binding site of Egr1, a transcription factor gene. This transcription factor belongs to the EGR family of C2H2–type zinc finger protein. The products of the target gene it activates are required for differentiation, mitogenesis, and regulation of erythropoiesis. The proband exhibited both these mutations in homozygous form, the mother had both these mutations in the heterozygous form which explained the hemogram and variant analysis values indicating β-thalassemia trait, whereas the father did not exhibit either of these. Since HbF values were higher in the father and the proband showed homozygosity of IVS 1–1 G>C, with the fact the father being negative for the same, there was a strong possibility of δβ deletional mutation in the father. This hypothesis could plausibly explain the presence of homozygosity in proband for IVS 1–1 G>C. Delta-β-thalassemia (δβ-thalassemia) is characterized by the persistent expression of γ-globin genes in adults in association with decreased or absence of δ- and β-globin gene expression, leading to increased HbF concentrations, and presence of hypochromic and microcytic erythrocytes., Heterozygous carriers of δβ-thalassemia (δβ°) show HbF levels ranging from 4.0% to 18.6%. The δβ deletion mutations are also specific to different ethnic backgrounds such Black, Ghanaian, Indian, Vietnamese, Thai, Italian, and Sicilian types. However, the father did not exhibit the HPFH3 nor the Indian Inv/Del Gγ (Aγδβ)0 which is predominantly seen in the Indian population. Further analysis of this locus in the father revealed the HBG-XMn1 “AG” genotype indicating the presence of the Arab Indian haplotype in heterozygous form. This haplotype has been conventionally associated with high HbF levels which may to some extent explain the high HbF levels seen in the father. In addition, the HBG-XMn1 is in strong LD with the -68C>T polymorphism which is the 5' proximal to the delta globin promoter. Interestingly, although which HBG XMn1 was seen in heterozygous state “AG” genotype, the-68 C>T was in homozygous state “CC” again raising the possibility that there may be deletion of the delta gene other than HPFH3 or Indian Inv/Del Gγ (Aγδβ)0. In such a scenario using the Multiplex Ligation Probe Assay technique, it may be possible to interrogate all possible deletion. Alternatively, there is also a rare possibility the proband inherited one mutation from the mother and the other was de novo as no uniparental disomy was seen in the proband. This report highlights the complexity that is possible when evaluating individuals, especially partners with suspected hemoglobinopathies. This report highlights the importance of molecular studies in partners suspected of β-thalassemia trait and/or other hemoglobinopathies. Participants with borderline HbA2 levels including spouse of a typical β-thalassemia carrier should be extensively investigated. The presence of aberrant RBC indices and Hb fractions is a strong indication for additional molecular studies and counseling regarding the risk of clinically significant hemoglobinopathies or thalassemia in fetus. The prenatal diagnosis should be offered to couples at risk. The authors certify that they have obtained all appropriate patient consent forms. In the form, the patient has given her consent for her images and other clinical information to be reported in the journal. The patients understand that their names and initials will not be published and due efforts will be made to conceal their identity, but anonymity cannot be guaranteed. Colah R, Italia K, Gorakshakar A. Burden of thalassemia in India: The road map for control. Pediatr Hematol Oncol J 2017;2:79-84. Kumar R, Singh K, Panigrahi I, Agarwal S. Genetic heterogeneity of beta globin mutations among Asian-Indians and importance in genetic counselling and diagnosis. Mediterr J Hematol Infect Dis 2013;5:e2013003. Lahiry P, Al-Attar SA, Hegele RA. Understanding beta-thalassemia with focus on the Indian subcontinentand the Middle East. Open Hematol J 2008;2:5-13. Colah R, Gorakshakar A, Phanasgaonkar S, D'Souza E, Nadkarni A, Surve R, et al. Epidemiology of beta-thalassaemia in Western India: Mapping the frequencies and mutations in sub-regions of Maharashtra and Gujarat. Br J Haematol 2010;149:739-47. Varawalla NY, Old JM, Sarkar R, Venkatesan R, Weatherall DJ. The spectrum of beta-thalassaemia mutations on the Indian subcontinent: The basis for prenatal diagnosis. Br J Haematol 1991;78:242-7. Nadkarni A, Gorakshakar A, Surve R, Sawant P, Phanasgaonkar S, Nair S, et al. Hematological and molecular analysis of novel and rare beta-thalassemia mutations in the Indian population. Hemoglobin 2009;33:59-65. Fortina P, Dotti G, Conant R, Monokian G, Parrella T, Hitchcock W, et al. 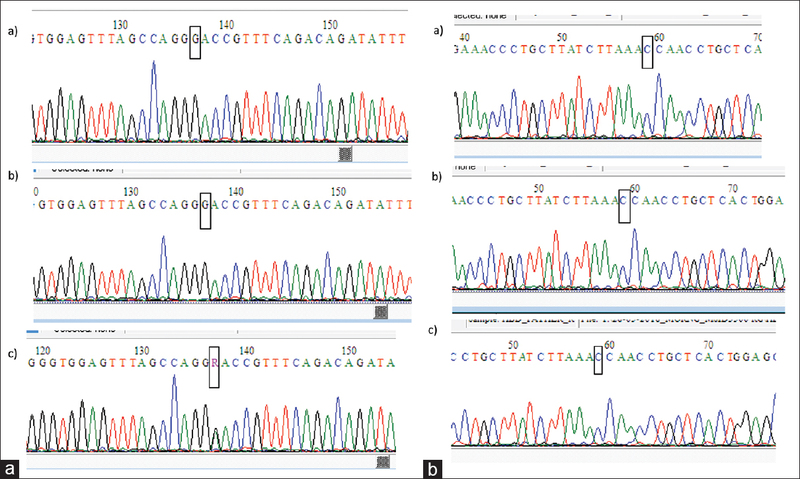 Detection of the most common mutations causing beta-thalassemia in Mediterraneans using a multiplex amplification refractory mutation system (MARMS). PCR Methods Appl 1992;2:163-6. Bhanushali AA, Patra PK, Pradhan S, Khanka SS, Singh S, Das BR, et al. Genetics of fetal hemoglobin in tribal Indian patients with sickle cell anemia. Transl Res 2015;165:696-703. Craig JE, Barnetson RA, Prior J, Raven JL, Thein SL. Rapid detection of deletions causing delta beta thalassemia and hereditary persistence of fetal hemoglobin by enzymatic amplification. Blood 1994;83:1673-82. Moosa MM, Ayub MI, Bashar AE, Sarwardi G, Khan W, Khan H, et al. Combination of two rare mutations causes β-thalassaemia in a Bangladeshi patient. Genet Mol Biol 2011;34:406-9. Sultana GN, Begum R, Akhter H, Shamim Z, Rahim MA, Chaubey G. The complete spectrum of beta (β) thalassemia mutations in Bangladeshi population. Austin Biomark Diagn 2016;3:1024. Fattoum S, Guemira F, Oner C, Oner R, Li HW, Kutlar F, et al. Beta-thalassemia, HB S-beta-thalassemia and sickle cell anemia among Tunisians. Hemoglobin 1991;15:11-21. Fedorov AN, Nasyrova FY, Smirnova EA, Bocharova TN, Limborska SA. IVS-I-1 (G-->C) in combination with -42 (C-->G) in the promoter region of the beta-globin gene in patients from Tajikistan. Hemoglobin 1993;17:275-8. Hamid M, Shariati G, Saberi A, Kaikhaei B, Galehdari H, Mohammadi-Anaei M, et al. Identification of IVS-I (-1) (G>C) or Hb Monroe as a report on the beta-globin gene with a beta-thalassemia minor phenotype in South of Iran. Arch Iran Med 2013;16:563-4. Gonzalez-Redondo JM, Stoming TA, Kutlar F, Kutlar A, Hu H, Wilson JB, et al. Hb Monroe or alpha 2 beta 230(B12) Arg-Thr, a variant associated with beta-thalassemia due to A G-C substitution adjacent to the donor splice site of the first intron. Hemoglobin 1989;13:67-74. Agarwal N, Kutlar F, Mojica-Henshaw MP, Ou CN, Gaikwad A, Reading NS, et al. Missense mutation of the last nucleotide of exon 1 (G->C) of beta globin gene not only leads to undetectable mutant peptide and transcript but also interferes with the expression of wild allele. Haematologica 2007;92:1715-6. Forget BG. Molecular basis of hereditary persistence of fetal hemoglobin. Ann N Y Acad Sci 1998;850:38-44. Williams TN, Weatherall DJ. World distribution, population genetics, and health burden of the hemoglobinopathies. Cold Spring Harb Perspect Med 2012;2:a011692. Huisman HJ, Carver MF, Baysal E, Efremov GD. HbVar: A Database of Human Hemoglobin Variants and Thalassemias. Summaries of Mutation Categories. Pennsylvania University USA and McMaster University in Canada; 1996. Available from: http://globin.bx.psu.edu/cgi-bin/hbvar/query_vars3. [Last accessed on 2018 Mar 1].